Nice quality, great price point for everything you get! Enrich your sleep space with some shabby chic splendor with this comforter set. A mixture of soft coral, orange, and hints of green are printed in a paisley design alongside pintucked coral fabric that is separated by lace taping. A ruched white flange around the edge gives an extra touch to this beautiful set while three decorative pillows with pleating, embroidery and ruching details complete this look. 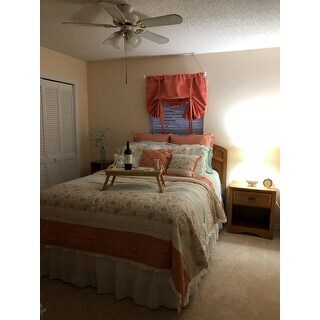 Set includes one comforter, two matching shams, one bed skirt, three decorative pillows, two Euro shams. What a beautiful comforter set. It is very soft with soothing colors and the perfect weight for all seasons. I was a little worried about the coral color but it is just the perfect pop of color to brighten things up. It comes with everything you need, both euro and regular sham's, throw pillows and dust ruffle. Plus it's a great price for a complete set delivered to your door. You won't be disappointed. This is a very pretty set. I purchased this after getting new bedroom furniture and wanted something summery but not overly feminine. I’m only giving it 4 stars because the comforter is not as thick as I was hoping for but I am overly picky about that. I also wish there were extra shams to purchase. I have a king bed and it would look better with another euro pillow. Quality is nice and I think it will hold up well. When I ordered this comforter I had also ordered curtains. Wasn't thinking about the color matching at the time, really hard to tell true color from a picture but the colors matched perfectly. This comforter is really nicely designed. It is heavy enough to keep you comfortable without making you sweat. Looks very posh! I am so pleased with this comforter. I spent a year searching for a light colored comforter that would look good with my dark wood furniture. The coral really brings out the color in the oak wood. Painted the walls a light creamy color and added white sheers that match the white doors and woodwork. SO VERY HAPPY! What a lovely warm comforter, warmer than any I've ever had. The pillow set is so delicate looking. Makes my room very cozy. I had purchased this comforter set in blue probably 3 years ago. I loved it. It is a very well made comforter. So now I got it in coral for my guest room. It washes up very well. I very much recommend this. We are very happy with the comforter set. The colors are vibrant and perfect for our room. The weight of the comforter is just right, so that we don't have to have a blanket on our bed in the winter, but it is light enough for the summer, too. Love love love this Comforter Set! It really makes my bedroom look classy and the feel of the material feels so comfortable! So glad I ordered it! You wont go wrong with this set! The bedding was just as described. The colors are amazing and the bedding is soft. If there was anything that I could change it would be for the set to include sheets. Overall though, I love it. Beautiful, comfortable and fluffy... very elegant. This bedding does not look like the photos at all. The pillows have faded quite a bit. It is too thick to be comfortable. All and all, I would not purchase again. I love my new comforter set.I recommended to my friends and family. Love the color Have to wash at laundromat to big for washing machine (full Size) and I find the comforter after a few washes bunches up the batting inside. Although I did buy another in the mint green color. A little on the thin side, so its perfect for sweaty sleepers. Well crafted and stitched. The throw pillows are adorable. Well protected shipping and prompt. I bought this set and the gray colored set for the same room. They are so beautiful and great quality. Bought for a birthday gift for my daughter. The colors are perfect and you get a lot of bang for the buck! Would definitely by this brand again. "Is this coral or salmon?" It is coral. I hope it helps. "Is this a duvet or comforter "
Buying a new bed so decided to buy new bedding as well and one of my favorite shades of color. "Where is these made, is it made in USA?"